Learn the difference between co-products and by-products in the manufacturing process, and how to handle each within a company's SAP ERP system. products that are created in the process. Some of these additional products are of significant financial value and therefore desirable to the company. The company can sell such additional products as standalone products, or even use them in other production processes. Additional products with significant financial value are known as co-products. Undesirable or low-value additional products produced in the manufacturing process are known as by-products. Both of these products are inventory-managed in the system. Co-products and by-products differ from scrap, in that scrap is charged off to the cost of production and is not inventory-managed. 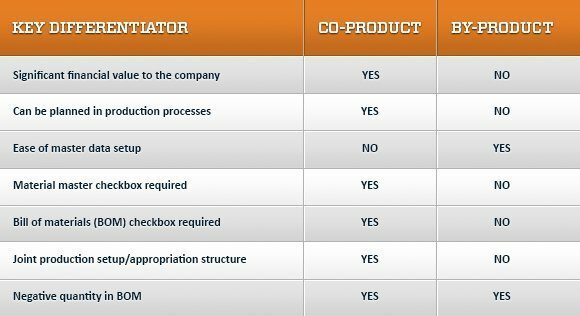 When deciding to categorize an additional product as either co-product or by-product, the person who manages product-cost controlling in the company determines how these products are treated financially. Table 1 can help in the decision-making process and also the efforts involved in some of the relevant settings in the SAP ERP system.